The son of educators, Pete grew up in South Bend, where the value of education, hard work and giving back to the community was instilled in him at an early age. He was valedictorian of his high school class and went on to earn a degree from Harvard before studying economics at Oxford University as a Rhodes Scholar. While his career has mainly been in the private sector, Pete has always been committed to public service. He co-founded the Democratic Renaissance Project, an organization of young people dedicated to bringing new ideas into public debates, and serves as a Fellow at the Truman National Security Project. He has also worked on Capitol Hill, at NBC News in Chicago, and on congressional, gubernatorial, and presidential campaigns. A past president of Harvard’s Institute of Politics, Pete’s views on youth civic engagement and international affairs have appeared on National Public Radio, on local television and radio, and in newspapers including the Boston Globe and New York Times. 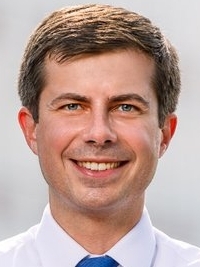 In his free time, Pete enjoys relaxing with family and friends, following Notre Dame football and restoring a historic home he recently purchased in the South Bend neighborhood where he grew up. 05/19/2020 KY US President - D Primary ??? 04/04/2020 HI US President - D Caucus ?? ?